Beijing is not a good city for transport. The subway is rammed full at all hours, the roads are gridlocked for good chunks of the day, and bus lanes and queuing don’t seem to have caught on. The only reliable way to get around is by bike. There are dedicated lanes everywhere, the whole city is flat, and you’re never more than five minutes away from a repair stand. The idea that there are nine million bikes here is a bit of a fib though. Fifteen years ago, possibly. These days having a bike says “I’m poor” and poor = not cool, and everyone wants a car. In the bike park downstairs there’s a huge pile of rotting old bikes, and I expect there are many more around the city. When I first moved to Beijing in 2007 buying a bike was third on my ‘to do’ list after ‘get a job’ and ‘get paid’. I found a classy shop in the centre and bought an impressive looking machine for just over 300 kuai (£30). It came with a huge rope-like bike lock, and I stored it in a huge bike park under my office building, guarded by a surly man in a mao suit. One day, about three weeks later, it was gone. The lock was on the floor, open, surly mao suit man shrugged and performed a perfunctory search. A bit annoying, but not really a surprise. A student told me that she’d been to a bike park and had asked the attendant if she could buy one. “Which one?” he asked. “that pretty white one,” she said. The bike was locked, obviously not the property of the attendant. “Come back tomorrow, you can have it for 60 kuai.” So it goes. The lesson was pretty clear – if you want a bike, don’t get one that somebody else will want to steal. So 16 months ago I bought the oldest, most wrecked looking thing I could find and changed the broken parts. Here it is. 1 – For some reason in the west baskets are considered twee and girly. Screw that, where else am I going to put my shopping? 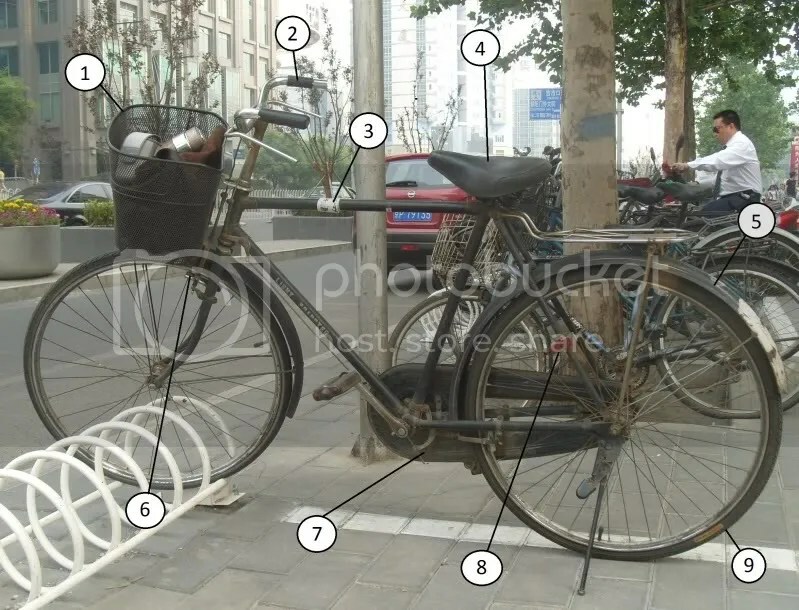 Every bike in China has a basket. 2 – The handlebar covers seem to be from two different bikes, and one has half-fallen off. This does not affect functionality at all, whilst maintaining the whole “broken” vibe. 3 – This sticker means I can keep my bike in a bike park for a month, for 3 quai (30p). Shame I only use it once a week. Usually I keep my bike outside my office (as in the photo above), where it’s guarded by an old lady in a sash who charges me 2 mao (2p) a time. When not guarding bikes she goes through the bins to find plastic bottles to sell to the recycling centre. 4 – This seat is new, and unfortunately looks it. Previously instead of a seat there was a comfortable mesh of foam and broken springs, but V insisted that I change it. Uncomfortable and suspiciously expensive-looking, actually it just cost 10 kuai (£1). 5 – Why do old bikes have white paint on the back? Some sort of night visibility concept, perhaps. The frame looks old and battered, but actually it’s fine, not even really rusty. 6 – The brakes are fine. I need to get them changed every six months, but since they are 5 kuai (50p) each it’s not a big deal. 7 – Nasty rattly clanky chain cover, with a (shhh!) good quality new chain inside. 8 – Tiny, flimsy bike lock which could probably be opened with a pin. I have left this bike at a busy intersection for a week, returning to find it lying on its side. Obviously nobody wants to steal it. 9 – New tyres with good quality inner tubes inside. At first these looked far too new, but the day after I had them changed somebody decided to paint new lines on the street and I left work to find the lower half of the bike speckled with white paint. Great news.